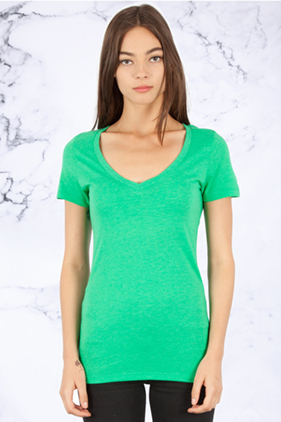 Versatile fabric is naturally absorbent with a delicate drape similar to your favorite worn in tee. 50% polyester/25% combed ring-spun cotton/25% rayon, 30 single, 4.6 ounce tri-blend women's V-neck t-shirt. Special blend creates a comfortable, soft and long-lasting fabric with a silky feel. Shoulder to shoulder neck tape. Side-seamed. Pre-laundered fabric. Superb fit. Tear away label. South Korea fabric.